Philadelphia 76ers guard Markelle Fultz dunks against the Atlanta Hawks in the second quarter at Philips Arena. By now, you have probably heard in some form or fashion that Markelle Fultz has been diagnosed with thoracic outlet syndrome. Whether you got the news from Adrian Wojnarowski, the Sixers' press release, or a push alert from your sports app of choice, you know this — Fultz has been diagnosed with something formally, and now the world unfolds from here. Markelle Fultz has recently completed a thorough series of consultations with specialists across several disciplines. Thoracic outlet syndrome, which involves compression or irritation in the thoracic outlet (area between lower neck and upper chest), was identified. Physical therapy was recommended for Fultz before returning to play. Fultz will begin this physical therapy immediately, is out indefinitely, and further updates will be provided as appropriate. Now, we dive deeper into the weeds. Throughout the process of figuring out exactly what's going on, a source told PhillyVoice that Fultz has seen over 10 specialists and that the root cause of the various symptoms (most pertinently the wonky shooting mechanics) remains an unknown. According to a source who spoke to PhillyVoice, the indefinite timetable is being used as a stand-in because the team simply can't pinpoint an accurate window for the issue(s) at hand. Unlike something like say, a bone break, this centers around Fultz's tolerance threshold and level of discomfort rather than something as clear as a clean X-ray. Speaking with a team representative on Tuesday evening, the Sixers framed this new diagnosis as a positive. PhillyVoice was told the physical therapy he will be receiving as part of his new plan is consistent with the physical therapy he has been receiving throughout the process, though there will obviously be more specific exercises and treatments moving forward. NBA Trade Rumors: Can Sixers afford to turn down first-round pick for McConnell? Yet all of this seems rather incongruent. The Sixers (and Fultz's camp) have left it open enough to explain away a long absence, but they have left it equally open to him returning within the next three to six weeks. Even with the clarity of a formal diagnosis, this seems like a potentially short turnaround for an issue that has been ongoing for 15 months, and one that has dramatically impacted Fultz's play on the floor. There's also the matter of, "Why finally now?" Various theories discussing the thoracic nerve have been floated on Twitter dating back to the night of his infamous free-throw against the Miami Heat on November 12. One of the most prominent instances came from Avikar Saini, who went through a step-by-step explanation of why he believed this was the case that night. He was not the only person to make suggestions within this realm. And so at this juncture, there's a clear and obvious question to ask — why did it take until Tuesday, December 4 to determine this was the issue if someone with no medical access to Fultz could make a fairly accurate guess from hundreds of miles away? Why would this not be among the first topics of conversation upon meeting with a specialist early last week, given that members of the Fultz camp had gone so far as to deny on the record other theories that have been floated about him? Turns out, there was not a concrete answer to that. Admittedly, based on the public record of other athletes who have experienced this issue (primarily baseball players), it's an issue that can be hard to pinpoint, an option far down the list compared to other, more conventional shoulder troubles athletes experience on a routine basis. But multiple sources confirmed to PhillyVoice that this was not the first time the topic of thoracic outlet syndrome had come up. One source who spoke on the condition of anonymity said during a visit with a specialist in, "recent months," it was floated as a suggestion, but not as a formal diagnosis. So at the very least, this was something that had emerged as an issue to target and not as a fever dream of anybody with access to social media. According to a source, it was not until Tuesday, December 4, that Fultz had his final consultation of the process, where it was recommended by a doctor that he undergo physical therapy and be held out of play indefinitely. This was the first time, a source told PhillyVoice, that any internal or external specialists have recommended for Fultz not to play for a period of time. As I reported during last February's story involving the first chapter of the Fultz saga, there has not previously been an extended period of time in which Fultz was barred from all basketball activities. He continued to work on his jumper last winter inside and outside the team's practice facility. The eventual conclusion not coming sooner can at least partially be attributed to the wishes of Fultz himself. A source with knowledge of the situation expressed that it was important to Fultz for this process to be, "exhaustive and comprehensive," which is understandable given the prominence of his issues and how they've impacted his young career. One way in which this is all branching from the usual Sixers injury standards is the communication surrounding who Fultz has seen and when. Pressed on the matter by PhillyVoice, the team would not disclose any of the specialists (or even their disciplines) Fultz has seen during this exploratory process, which is a stark contrast from basically every medical update they've done in recent memory. The Sixers even named the surgeon who performed Zhaire Smith's thoracoscopy in late September, despite his issue there existing far outside the usual sphere of athlete maladies. Fultz's agent, Raymond Brothers, offered no comment when contacted about the same topic. Ultimately, all of this is going to come down to whether or not Fultz shoots again during his career, regardless of what today's diagnosis is and whether it helps fix the issues he has been dealing with. For now, a lot of questions remain. It is certainly worth questioning why a summer was spent changing the shooting mechanics of a No. 1 overall pick who was an elite shooter in college if Fultz (or absolutely anyone in his inner circle) believed there was an underlying medical issue that he was having to work around in order to shoot a basketball properly. 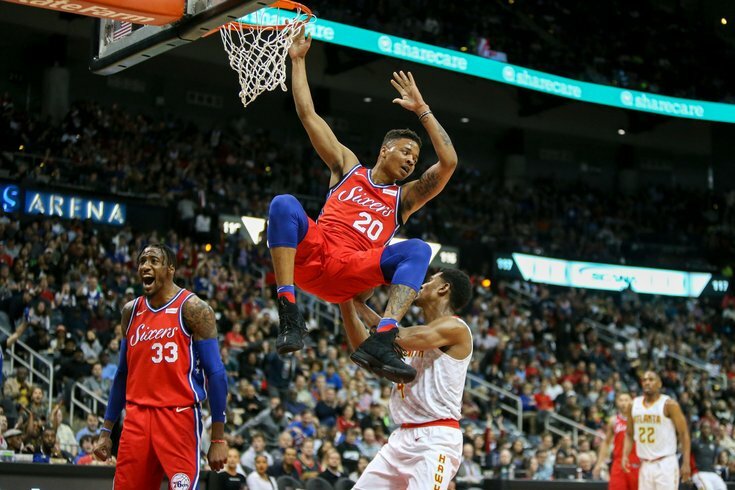 It is certainly worth questioning why this step to shut him down was not taken in earnest until after he was sent to the bench in favor of T.J. McConnell during Philadelphia's win over the Phoenix Suns, and why his free-throw gaffe against the Miami Heat was explained by Fultz as a simple "slip" instead of the product of an issue he was experiencing at the time. It is certainly worth questioning whether this is indeed another instance of an oft-criticized medical staff simply screwing something up, and what the repercussions should be if this falls on the Sixers botching his plan of action. And it is certainly worth questioning whether this is still worth Philadelphia's time to deal with, as the team prepares to compete for the highest honors in the NBA this season, and not whenever we can figure out when the real Markelle Fultz will emerge from the ether.